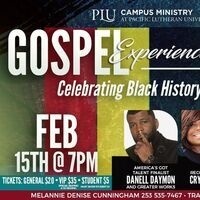 In celebration of Black History Month 2019 we invite you to join us on the PLU campus for a Gospel Experience concert. Performances by PLU alumna and national recording artist Crystal Aikin '97 and America’s Got Talent finalists DaNell Daymon & Greater Works. Tickets: General $20, VIP $35, PLU Faculty/staff $10 and students with valid ID $5. General $20, VIP $35, PLU Faculty/staff $10 and students with valid ID $5.